Would you like to be a great hitter, have quick wrists, a keen eye, and a powerful swing? Well, now you can. The secret is hitting live pitches from a pitching machine . . . Introducing BaseHit, The safest and most affordable real baseball pitching machine that makes you a great hitter at home or away. 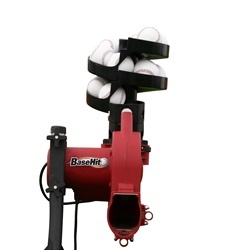 Unlike other high priced pitching machines that have dangerous exposed spinning wheels, require a second person to feed balls into the machine, and are so big & bulky it takes almost an entire team to carry the machine on and off the field, BaseHit's revolutionary design incorporates a fast spinning motor and small covered wheel to pitch balls with the world's most compact pitching machine ever developed. This compact design allows BaseHit Pitching Machine to be shipped to your door inexpensively or brought home from the store in the backseat of your car. And once home, assembly is a breeze . . . Simply open the box and snap three tubular steel legs into the tri-pod stand, attach BaseHit's high-impact composite pitching housing with two quick-attach knobs and slide BaseHit's auto-ball feeder onto the pitching housing. Plug the power cord into an electrical outlet and in a matter of seconds, you're ready to hit from your very own solo pitching machine! 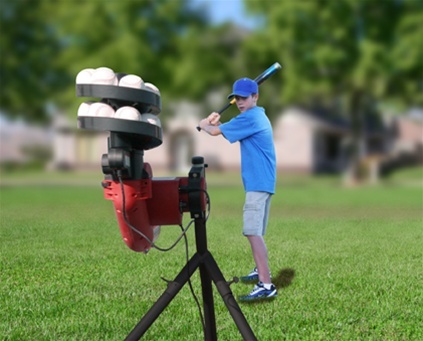 Just place 12 leather baseballs,dimple balls wiffleballs, soft lite dimple balls or poly balls into the auto-ball feeder, adjust the pitch height and BaseHitï¿½s 6" air filled wheel cushions and pitches the ball resulting in pin-point accuracy, so hitting that perfect pitch has never been easier! And BaseHit Pitching Machine comes with a variable speed control, so you can hit pitches from speeds of 15 to 45 MPH. And if that's not fast enough . . . Simply move BaseHit closer towards you. This reduces your reaction time and can simulate fastballs from 50 to 90 MPH! PLUS..you receive a 12 Ball Autofeeder ($149 Value) at no additional charge. Uses Real leather baseballs or dimpled balls, baseball size wiffle balls or baseball size lite-balls. CLICK HERE FOR THIS MACHINE AND A POWER ALLEY BATTING CAGE! !